I made obeisance at the altar of Mammon by visiting the winter sales in Aberdeen. I slouched my way up one side of Union Street, and down the other in search of a jacket that wouldn’t fit. The jackets at massive discounts were in 44L or 38S and I’m a regular sort of guy. When I pounced on a cool jacket I was politely informed “Oh, this one’s not in the sale, Sir.” Thirsty and hungry, I came in sight of the St Nicholas shopping centre which drew me in. Eventually I arrived at its sister shopping centre which, as it name says, was ‘happy to meet me.’ I rested my very sorry frame on a seat in the gallery area, to be nourished with coffee and a pastry. Food for thought…. Our Father in heaven – in whose temple am I sitting? The tiled floors and walls, and the moving ladders to where? Two escalators up into shopping heaven and John Lewis, one escalator down, casting the shopper into the outer darkness of George Street. Meanwhile the ever watchful eyes of the CCTV and uniformed ‘vergers’ observed me closely. Hallowed be your name – “Style and Substance” boasts the centre, Currys, Disney Store, Dorothy Perkins, Ernest Jones, H&M, Laura Ashley, Marks and Spencer, Monsoon, Next, Swarovski, The Body Shop, Tie Rack, Topman, Warehouse, holy names, sacred, consecrated, sanctified, blessed and revered. on earth as in heaven – already present in our midst, though not yet revealed. Is God’s kingdom to be found in this sacred space? Sacred to the cult of consumerism? Who are these high priests serving us with our material needs as we strive to glamorise our lifestyles, in remembrance of the pages of the glossy magazines? Give us this day our daily bread – all our earthly needs are met. From a quick snack to a leisurely lunch, we are enticed by the trends and the best buys, a ‘fabulous’ frock, lotions and potions for her and the phones and up-to-the-minute technology for him. Even an Aladdin’s cave of radio controlled helicopters, trains, with collectables from Star Wars, Harry Potter, Dr. Who and Star Trek. All for the child within us. Do not bring us to the time of trial – is this about owning up to our acquisitiveness, our greed, the growing gulf between rich and poor? How much do we need for a sustainable lifestyle? What does living lightly mean? How will we manage our debt burden in 2012? But deliver us from evil. Is this really an evil place? 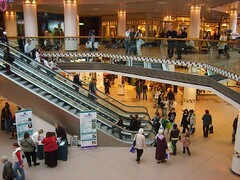 Bon Accord and St Nicholas and other shopping centres in the city are large employers, major contributors to the local economy, some working with the local community and supporting many local and national charities. Most of Aberdeen’s wealth is from the oil industry, a depleting source of energy supply, but as the oil industry declines opportunities will arise to use its skills, supply chains and technologies to develop alternative forms of sustainable energy and carbon capture, to try to reverse the effect of global warming. In this moral crisis there is yet hope. Life is not easy. It is a daily battle. Trials can crush our spirits. False values and easy promises endanger our souls. We need to recognise that we need the earth more than it needs us. Our ‘transcendence’ is a fiction. More than ever before we need to restore our impaired relationship. And so we ask God to keep us from failing when we are tested, to help us to know the right thing to do, to avoid the evil which waits to ensnare us. Back home, I switch on my iMac, search the virtual stores of Aberdeen. I find the jacket I have been looking for, in a size that will fit and at half-price! I click and collect….Oh dear! Lord have mercy. I am completely bemused by the ‘Occupy the London Stock Exchange’ protest. It seems that the protestors were prevented bearding the lion in its den and chose instead to wound a behemoth, one caged by the rules and regulations of a litigious society, which has behaved rather predictably, as wounded animals do. Meanwhile the self-styled ‘masters of the universe’ are mooning the crowd from their mirrored towers. So now we have this encampment, or should one describe it as a pied-à-terre for occasional protest? I don’t have the benefit of infra-red vision but some of the protestors who were interviewed by the media seem to have had pressing engagements which militated against a 24/7 occupation. I try to be optimistic that their willingness to obey the injunction against occupying Paternoster Square may indicate that when the authorities obtain one for St Paul’s Churchyard they will quietly move on. And this is my dilemma. I want to support them but I do not understand their argument with St Paul’s. Do they think that Mammon is holed up inside? There is a lack of political coherence. “All emotions and abstractions,’ as Joni Mitchell would say. Yet the 99% are in sympathy with their aims and share their frustration that the malfunctioning global financial system is proving resistant to reform. But, for as long as they continue to berate the institution of St Paul’s and haughtily spurn all attempts at mediation, however ineptly done, the more the media will focus on this squabble. To the “What would Jesus do?” question, I suggest that he would have checked in for the ‘vibe’ but quickly moved on to the parts of the city that are hurting. Jesus was continually exhorting his followers to move beyond the city and preach the coming of the Kingdom of God to the earth. It is the people, the oikumene who are the place of God not a tented space; and the sacredness of cathedrals lies only in the way they facilitate the union of believer and Jesus Christ the Saviour. There needs to be dialogue not sententious banner waving. What we seem to have at the moment is dis-place-ment therapy. As Richard Rohr asks in Simplicity: the Freedom of Letting Go, “How is it that we’ve managed so effectively to avoid everything that [Jesus Christ] taught so unequivocally?” We continue with the blame game, blaming institutions and not accepting that our victimhood stems from being seduced by the myths of the modernity project. We will not regain our freedom by trying to catch every trendy breeze.